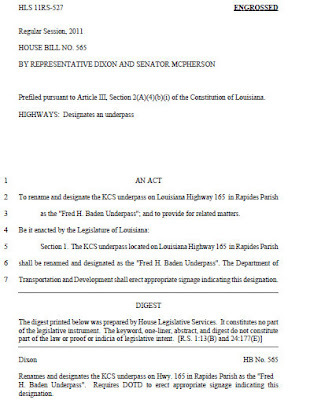 HB 565 just passed the state senate after passing the state house on 16 may 2011. 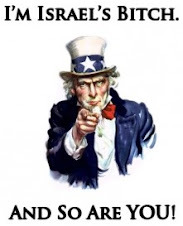 UPDATE: became ACT 199 24 june 2011. 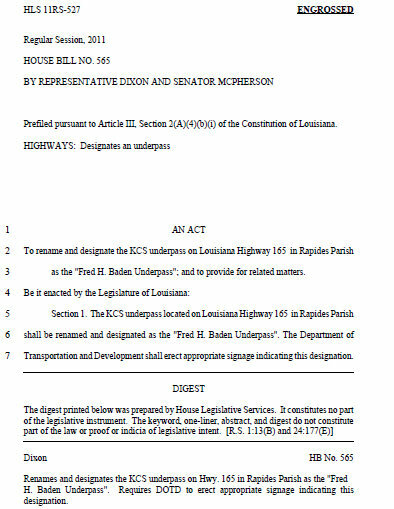 HB 565 will "[R]ename and designate the KCS underpass on Louisiana Highway 165 in Rapides Parish as the 'Fred H. Baden Underpass.'" it's probably fitting they chose this underpass ... mayor baden told, at least one time, this story about the underpass -- once an oversize load became stuck beneath the underpass. no matter what they did it seemed like they wouldnt be able to get the truck and its load free from beneath the underpass without doing a lot of damage to the underpass and the load. after awhile, a crowd began to gather to watch them; then a child walked up and suggested they "let some air out of the truck tires." so they did and it worked!